This seems to be a major catch for Windows 8 App ecosystem in India. Microsoft and IRCTC have jointly launched exclusive Windows 8 App that will run on Windows smartphones, Tablets as well as Windows 8 based PCs. It is interesting to note that press release sent to us says “The app has been made available exclusively for Windows devices”. I am not sure if it means that IRCTC app will be available for windows devices only and may not be ported as Android or iOs apps. 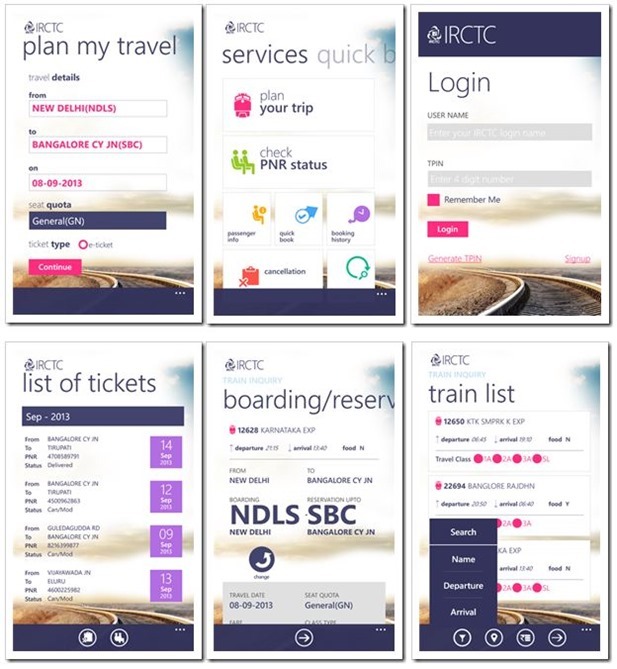 Talking about the app itself – the official Windows IRCTC app looks really good. While there are no details as to whether IRCTC in-house team built it or whether Microsoft had their people develop it for IRCTC. But who ever has built it, has done quite a good job of it. Here are some screenshots that will give you an idea of how good the app looks as compared to the drab web interface of IRCTC. Talking about the features of the IRCTC app, it does everything that a traveler will need from Finding the trains, booking the tickets to checking their PNR status. Essentially, this rich and immersive app performs all the tasks already available on the IRCTC web site. The app is built on Windows Azure platform for all the intermediately services between the app and IRCTC framework. Though Windows 8 smartphones and tablets do not have much penetration, this app would be extremely appealing to Windows 8 PC users (like yours truly). We downloaded the app and tried it and it was quite fast unlike IRCTC’s own web platform. I would highly recommend all Windows users to download this app. Once you see the app and book the tickets through it, I am 100 percent sure you will never go back to IRCTC web portal. Kudos to Microsoft and IRCTC for making our lives easier when it comes to booking train tickets! The only one change is it is not going to be logged off after few minutes. That it..